Viewed best at 800 x 600 or above. 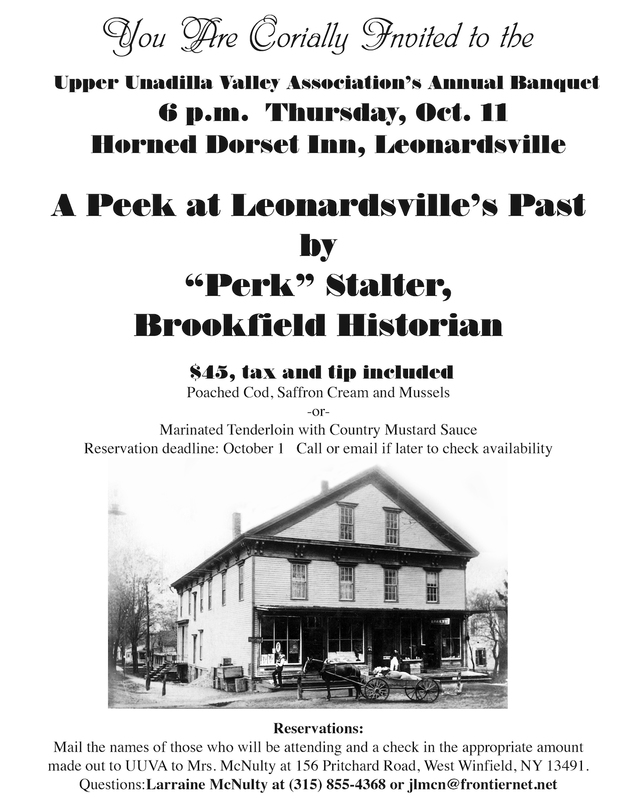 A Peek at Leonardsville's Past by "Perk" Stalter, Brookfield Historian will be the featured topic at the Upper Unadilla Valley Association's (UUVA) annual banquet on Thursday, Oct. 11. The event begins at 6 p.m. at The Horned Dorset Inn, 2000 State Route 8 in Leonardsville. The cost is $45 per person, including tax and gratuity. Beverages are additional. Reservations must be made by October 1st, For reservations, a check for the total number of reservations needed should be made payable to "UUVA" and mailed to association President Larraine McNulty, 156 Pritchard Road, West Winfield, NY 13491. For questions, call (315) 855-4368 or (315) 855-4403. The banquet's dinner features an appetizer choice of either Garden Leek and Potato Soup with Thyme Cream -or- Winter Squash Gnocchi, Sage, Walnuts and Prosciutto and Parmesan, an Autumn Salad, a main course of Poached Cod, Saffron Cream and Mussels or Pork Confit with Corn Relish and Marinated Tenderloin with Country Mustard Sauce cheese; and for dessert, Apple Streusel Slab Pie and Sweet Cream. The UUVA has worked for nearly five decades to help preserve and protect the natural and historic resources of the Upper Unadilla Valley, a region that includes areas in and around Bridgewater, West Winfield, Leonardsville, Unadilla Forks, and West Edmeston. To learn more about the association, visit www.uuva.org. Nestled along New York Route 8 between Utica to the north and Binghamton to the south lies the Upper Unadilla Valley, a scenic, rural basin with a rich history and quiet way of life. For generations, these simple treasures have woven a deep attachment for the land into long-time residents and lured newcomers, who often have stayed. Twice during the past 30 years, the landscape was threatened by plans for large-scale construction projects that would have changed the face of the valley forever. Both times, concerned residents belonging to the Upper Unadilla Valley Association challenged and successfully averted the proposed projects, saving the valley from unwanted change. 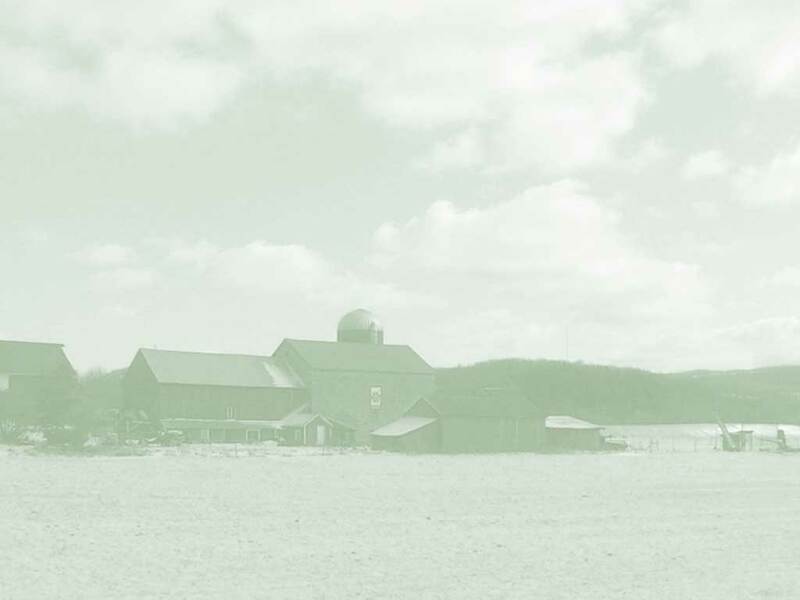 During the years in between and since, the association has hosted annual garden and craft shows, membership banquets, occasional membership drives, special events, and tours featuring both historic and modern homes, historic barns, residential gardens, local artists' studios, area geology and local industry. The Upper Unadilla Valley Association, which celebrated its 30th anniversary in 1999, remains committed to calling attention to the valley's treasures. This website is another step toward that end. It provides a close-up look at the Upper Unadilla Valley, viewing it from the past to the present in an effort to show why residents settled here in the first place, why they continue to stay, and why they fight so hard to preserve it. In 1969, the U.S. Army Corps of Engineers proposed a plan to build four large dams in the Unadilla Valley portion of the Susquehanna River basin for flood control and drinking water between Binghamton, N.Y., and Baltimore, Md., and recreational opportunities in the regions surrounding the reservoirs. Concerned valley residents renounced the plan, worried over the possibility of losing their homes, farms, businesses and local history. They united to fight the plan by forming a group of concerned citizens from five local communities: West Winfield, Bridgewater, Unadilla Forks, Leonardsville and West Edmeston. The Upper Unadilla Valley Association was born. To learn more about this struggle and the later successful thwarting of plans to put a 115 kilovolt powerline through the valley during the 1990s, click on the "political action" link. Today the Unadilla River is used for recreational opportunities year-round. The proposed dam would have created mud flats during summer "let-downs." At the core of the Association are fifteen directors, three from each of the five communities. Current directors are listed on the Communities page. The membership is a very loose group of anyone interested. There are no dues. A book is circulated at the Annual Banquet for names and addresses. E-mail us if interested. At the banquet awards are given yearly for local feats of Historic Preservation and Conservation. Various types of tours have been held since 1970 with informative booklets. Calendars and books have been published highlighting area history and architecture. Check the Events page for all of the organizations current happenings and publications.